This article is a short summary of Mario Kart 8. Mario Kart 8 is the Wii U installment in the Mario Kart series, and its eight main installment. The game was originally confirmed to be in development during the January 2013 Nintendo Direct before being officially revealed at E3 that year. Selling over 8 million copies, Mario Kart 8 is currently the best-selling Wii U game. MARIO'S TURNING MUSHROOM KINGDOM UPSIDE-DOWN! Feel the rush as your kart rockets across the ceiling! Race upside-down and along walls on anti-gravity tracks in the most action-fueled Mario Kart™ game yet! Take on racers across the globe and share videos of your greatest moments via Mario Kart TV. Basic gameplay is retained from the previous installments, in that players race across various tracks while using items spread across the track to gain an edge over opponents, though it is most similar to Mario Kart 7. Like Mario Kart Wii, twelve racers are able to race at once instead of eight, though like in Mario Kart 7 players are once again able to fly through the air with gliders and driver underwater, though new to this installment is anti-gravity, allowing players to drive across the walls and ceilings of a track at specified points. Kart customization also returns from Mario Kart 7, though this has been expanded upon to include bikes, returning from Mario Kart Wii, and a new kart type, ATVs. In addition to races, a battle mode is also available. When playing online, players can race or battle against a group of random players online or with friends, or join tournaments, which are similar in setup to Mario Kart 7. Players are also able to save their replays and post them online via the "Mario Kart TV" feature. 2.0 August 27, 2014 Adds a "Shop" menu to the main menu to download DLC, the option to display the course map on the TV screen with the Wii U GamePad, increases max online VR rating to "99999", allows players the view their stats from the main menu, saves the last used vehicle combination (minus DLC parts), swaps the positions of the "Next Race" and "View Highlight Reel" buttons after a race. 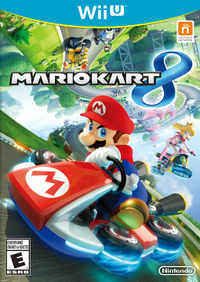 3.0 November 13, 2014 Enables the first DLC pack, adds amiibo compatibility, allows the game to save vehicle combinations using DLC parts, light karts pushed by heavier karts are not bumped as far, losing a race is not as punishing to the player's VR rating, allows players to set course limitations when playing online or creating a tournament. 4.0 April 23, 2015 Enables the second DLC pack, adds additional amiibo compatibility, adds a 200cc engine class, adds new Miiverse stamps, allows players to display the TV map while using any game-compatible controller, lets players race with CPU players while online, updates tournament settings according to the additional gameplay modes and courses. 4.1 May 1, 2015 Automatically unlocks all engine classes for players that have not unlocked them. Mercedes-Benz × Mario Kart 8 - A free pack that adds three karts based on Merceded-Benz vehicles. The Legend of Zelda × Mario Kart 8 - Adds two additional cups with four courses each, four vehicles, and Link, Tanooki Mario, and Cat Peach as playable characters. Animal Crossing × Mario Kart 8 - Adds two additional cups with four courses each, four vehicles, and Villager (male and female options available), Isabelle, and Dry Bowser as playable characters. Players can purchase the paid DLC either individually, or in a singular bundle for a lower price. In addition, by purchasing the latter two packs, eight color swaps for both Yoshi and Shy Guy are also unlocked. Mario Kart 8 Deluxe Nintendo Switch WW: April 28, 2017 A port of the game featuring all of the original release's downloadable content, as well as new items, tracks, playable characters, and gameplay modes. ↑ Mario Kart 8 Deluxe - Nintendo Switch Presentation 2017 Trailer. Nintendo (YouTube; January 12, 2017). Retrieved January 13, 2017. This page was last edited on 7 April 2017, at 16:07.